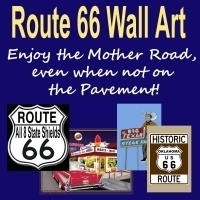 Dozens of notalgic Route 66 images in a variety of formats including original designs on posters, and lots more. Enjoy the Mother Road when you're not even on the pavement by decorating your home, office, bar, restaurant, or garage with these unique items. These many items are also great gift ideas for the Route 66 enthusiast. Britten Water Tower 11x17 Poster.